This is a Mass Effect Andromeda race guide on the remnant. Here you will find out about the strange synthetic race you meet in the Heleus Cluster. 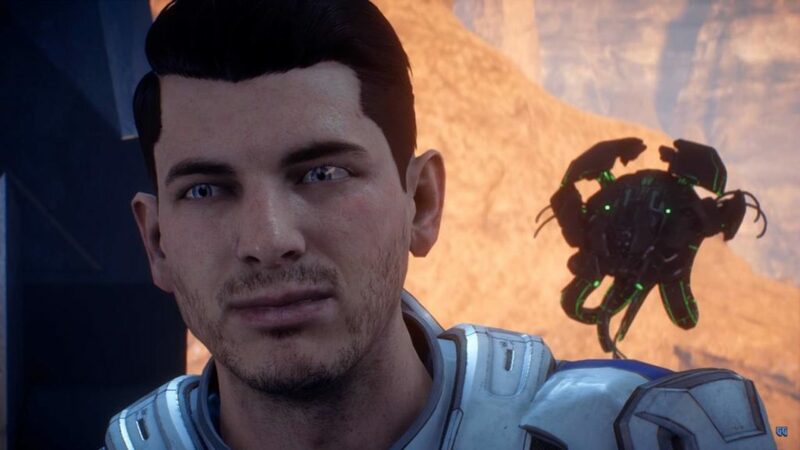 Pictured: Scott Ryder with an observer lurking behind him. Though they are small, they are NOT to be trifled with. “Remnant” is the umbrella term coined for technology, structures, and autonomous bots that have been signted across the Heleus cluster. Seemingly abandoned by whomever created it, this Remnant technology is extremely advanced, but most of it is in a “standby” state. On Habitat 7, Alec Ryder discovered that reactivating this technology requires scanning “glyphs”–data packets written in Remnants coding language–and my assistance with “interfacing” at particular consoles. This is complicated by Remnant bots that still guard and maintain many of these installations. Remnant bots do not appear to be sentient, but tehy are programmed to consider any interference with their technology as a hostile act, and attack single-mindedly. The Kett have an interest in Remnants technology, and have been sighted across the cluster attempting to study or control sites where it is still active. Evidence suggests the kett have not yet developed a reliable method of interfacing. The Remnants are called as such because of their seemingly abandoned nature. Alec Ryder discovered remnant glyphs. Remnant guards consider everyone interfering with their tech to be intruders, and will act against them. The Kett are interested in Remnants technology, but have trouble interfacing with them. An artificial creation must have a creator, but their is scant evidence of whomever created the Remnant. I have consulted the Nexus scientists, scans obtained by Peebee–on the condition that I not rearrange her data–and records of your own investigation, but my conclusions remain speculation. We can be certain that the Remnant builders are several orders of sophistication above the Initiative’s technology. Interlinked cluster-wide planetary engineering is beyond the logistics or budget of any known species. The energy requirements alone suggest a Type I civilization on the Kardeshev scale. On a cultural level, the builders must have been intelligent and capable of large-scale cooperation. The proportions of the vaults and devices found suggest a species with similar physical traits to humans, but with no genetic evidence left behind, their appearance–along with their motivations–remain a mystery.